Are the outspoken protests by working-class immigrants the beginning of a powerful new front against Trump? The people of New York know a bit about how to handle Donald Trump. After all, they’ve been doing battle with the real-estate magnate since he first launched his Manhattan empire in the 1980s. So the new celebrity presidency won’t intimidate the metropolis that he has spent a lifetime trying, and failing, to conquer. 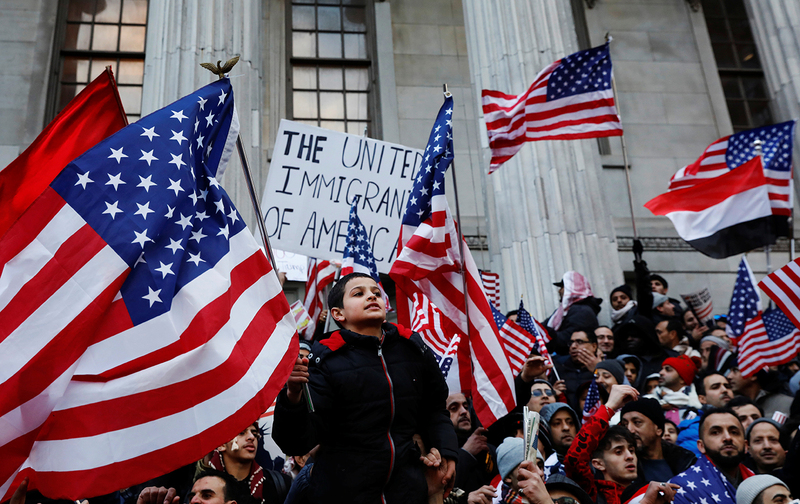 When the Trump White House dropped the executive order double-bombshell last week of the border wall and the Muslim migration ban, the city sprang instantly into action—righteously shocked but refusing to be awed. As an organization whose membership is largely Muslim, a workforce that’s almost universally immigrant, and a working-class movement that is rooted in the defense of the oppressed, we say no to this inhumane and unconstitutional ban…. Drivers stand in solidarity with refugees coming to America in search of peace and safety and with those who are simply trying to return to their homes here in America after traveling abroad. The group both denounced Trump’s executive orders and rebuked his new Silicon Valley pal—Uber CEO Trevor Kalanick. Not only does Uber’s rideshare business model—which has expanded globally by shredding local regulations and reducing once-stable driver livelihoods into precarious “gig work”—align with Trump’s anti-government worldview; Kalanick’s participation in Trump’s economic advisory committee has revealed how the fresh-faced tech world is more embedded in the establishment than its “progressive” image suggests. Uber, meanwhile, further insulted cabbies by continuing to operate during the airport strike, apparently exploiting the ridesharing “opportunities” offered by the work stoppage. The strike spiraled into a nationwide solidarity campaign: “#DeleteUber” spurred consumers to show their discontent with Kalanick by nixing the app from their phones. Kalanick eventually issued an olive branch, promising legal advice for drivers affected by the Muslim ban. But NYTWA, which organizes both cabbies and Uber drivers, weren’t satisfied, and rallied again yesterday, just ahead of Kalanick’s first scheduled business advisory council meeting, Uber’s headquarters in Queens. “Now is the time for all those who value justice and equality to join together in holding Uber accountable, not only for its complicity with Trump’s hateful policies but also for impoverishing workers,” the taxi workers stated in solidarity with #DeleteUber. But NYTWA kept the pressure on at the rally, contending that the anti-regulatory policies that tech upstarts like Uber promote suggest more about Kalanick’s true sympathies with the Trump administration than his retreat following a public shaming. Uber is a reflection, of what Trump wants to do. They are part of the same team. It doesn’t matter, if Uber tries to throw money at us….we know their ugliness. The drivers have fought back, the consumers have fought back, and we are going to continue to drive them back, as immigrants, and Muslims, and workers, and black people, as women, as queer people, we’re going to drive Uber out. Out of our homes, out of our cities, and take over as workers. Going forward, NYTWA is working with driver members to help keep families with overseas connections safe, and counseling some drivers currently overseas on how and when to return to the US. So for New Yorkers, pushing back against the ruling elite’s divide-and-conquer tactics is nothing new. Since last month, local anti-Trump protests have been bolstered by a “hate-free zone” in Brooklyn’s Kensington neighborhood, helping community members come together to show solidarity with Muslim families. Yesterday, Yemeni bodega owners, generally not known for radical activism, staged an unprecedented strike to show that despite the billionaire president’s bullying and bigotry, his hometown remained a city of proud migrant shop owners. The labor of Muslim and immigrant workers is key to the success of the American economy and it is time for us to use our power to fight back against Islamophobia, bigotry, and immigrant bashing…. United, we have the strength to fight back against hate and stand up for justice. Time for a reboot in Washington. Paradoxically, while slick tech CEOs are apparently cozying up to the new administration, angling for deregulation and tax breaks, another side of the new economy proletariat is emerging as the anti-Trump resistance.